The district supervisors of Butte Soil and Water Conservation District recognized a need for a guide to low stress management of livestock and in cooperation with the Natural Resources Conservation Service received a grant to produce a livestock management manual. Steve Cote, district conservationist for the Natural Resources Conservation Service (NRCS) in Arco, Idaho spent years studying low stress livestock handling, attending workshops, and actually working with livestock. 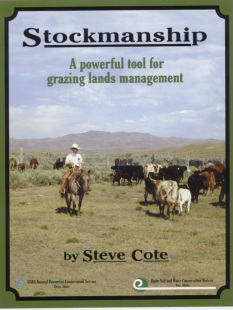 Cote then wrote Stockmanship – a Powerful tool for Grazing Lands Management based on his experiences. NRCS distributed the manual throughout the agency. Steve presented workshops in several states and Butte SWCD has reprinted the manual two times. Manuals have been shipped throughout the US, Canada, and many other countries. This project has been a steady source of income for the District. How to reduce handling stress, livestock sickness, and increase productivity. Copies of Stockmanship are available for $20 plus $3 shipping and handling by calling the Butte Soil and Water Conservation District at (208) 527-8557 ext 101 or emailing Frances Perkes at butteswcd@outlook.com Click on the link below for an order form.